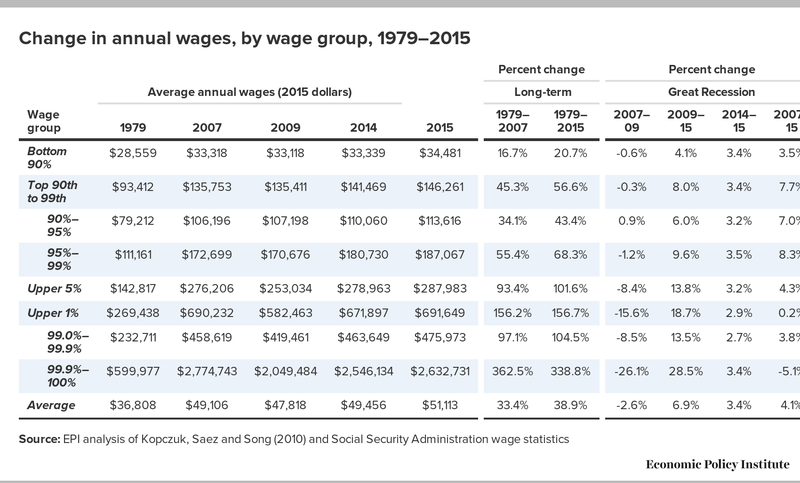 Annual inflation-adjusted earnings of the top 1.0 percent of wage earners grew 2.9 percent in 2015, and the top 0.1 percent’s earnings grew 3.4 percent, according to our analysis of the latest Social Security Administration wage data. What is relatively unique about 2015 was that the 3.4 percent wage growth for the bottom 90 percent matched that of the top 0.1 percent. This strong wage growth for the bottom 90 percent reflects both the lull in inflation (up just 0.1 percent) and the failure of wage inequality to continue its growth in 2015. Annual wages of the bottom 90 percent now stand 3.5 percent above what they were pre-recession in 2007, with all of that growth essentially occurring in 2015. The top 1.0 percent’s earnings have surpassed their previous high point, attained in 2007, by a mere 0.2 percent, recovering from the steep 15.6 percent fall during the financial crisis from 2007–09. High earners between the 90th and 99.9th percentile have seen the strongest growth since 2007, with earnings rising 7.7 percent. It’s only the earnings of the top 0.1 percent that remain below 2007 levels (down 5.1 percent). Wage inequality has grown tremendously over the longer-term period from 1979 through 2015. The annual earnings of the top 1.0 percent rose 156.7 percent from 1979 to 2015 while the very top 0.1 percent enjoyed earnings growth of 338.8 percent. In contrast, the bottom 90 percent of wage earners had annual earnings grow by just 16.7 percent over the 1979–2007 period and an additional 3.5 percent between 2007 and 2015 for a cumulative annual earnings growth of 20.7 percent over the thirty-six years from 1979 to 2015. In the analysis below we review these recent trends in greater detail. The table below shows that annual earnings, inflation-adjusted, for the bottom 90 percent of earners rose 3.4 percent in 2015, to $34,481. This is a welcome improvement from the slower 1.4 percent wage growth from 2013 to 2014 and corresponds to the growth in hourly wages we saw throughout the wage scale in 2015. Workers between the 90th and 95th percentile of wages saw comparable wage growth of 3.2 percent in 2015 (up from 1.3 percent in 2014) and the earnings of workers between the 95th and 99th percentile grew 3.5 percent (up from 1.9 percent in 2014). Among the top 1.0 percent, earnings for the top 0.1 percent grew comparable to the rest (3.4 percent in 2015, down from 8.9 percent in 2014), while those just beneath them—the next 0.9 percent—had a slightly slower 2.7 percent earnings growth (steady with 2.6 percent growth in 2014). Wage levels for everyone except the top 0.1 percent are now above where they were before the Great Recession in 2007, with exceptionally strong growth from the top 90 to 99 percent. Those in the bottom 90 percent earned 3.5 percent more in 2015 than in 2007, a growth of $1,163. Those just above, in the 90 to 95th percentiles earned 7.0 percent more in 2015 than in 2007, while those in the 95th to 99th percentiles saw an even faster 8.3 percent growth. The wages of the top 1.0 percent took the biggest fall in the 2007–09 downturn and therefore have had the most ground to regain. Despite a 28.5 percent growth in annual earnings from 2009 to 2015, the top 0.1 percent still earned 5.1 percent less in 2007. The top 1.0 percent as a whole though regained their 2007 earnings levels in 2015 achieving a slight 0.2 percent growth over the period. The top 90 to 99.9th percentiles achieved higher earnings in 2015 than in 2007 and, as mentioned above, now have their highest earnings levels ever. As you can see in the figure above, the longer-term trends show tremendous disparity in wage growth. 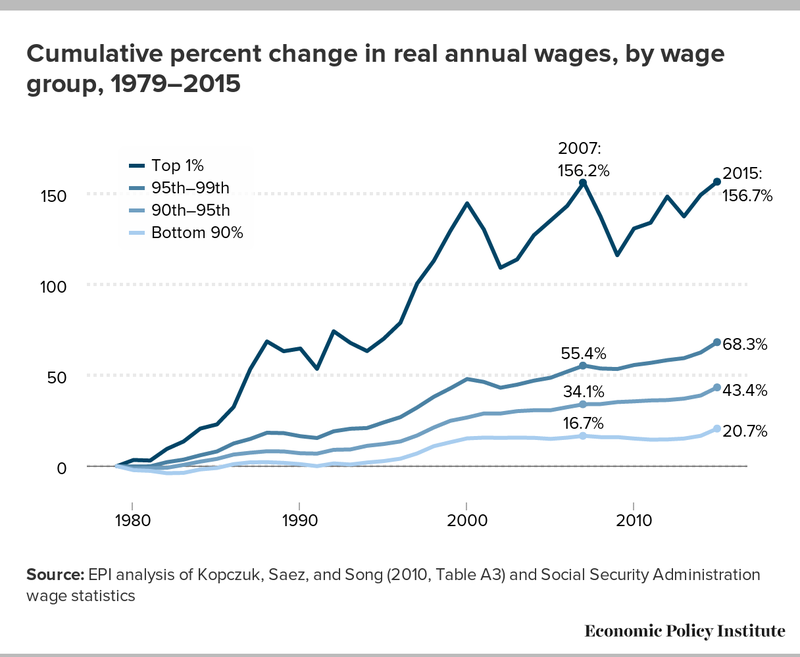 Wages of the top 1.0 percent rose 156.7 percent from 1979 to 2015, while the top 0.1 percent—the very highest earners (not shown above) —had earnings grow at least twice as quickly, up 338.8 percent since 1979. High wage earners below the top 1.0 percent saw their wages grow between 43.4 percent (90th to 95th percentiles) and 68.3 percent (95th to 99th percentiles) from 1979 to 2015. Productivity (net of depreciation) grew 63.9 percent from 1979 to 2015 and the only earners whose wages matched that growth were wage groups at the 95th percentile and above. The annual earnings of the bottom 90 percent rose just 20.7 percent from 1979 to 2015, and grew by only 4.5 percent since broad-based earnings stagnation began in 2002. In contrast, the wages of the top 1.0 percent grew 22.7 percent from 2002 until 2015. See David Cay Johnston for another, complementary take on these new wage data.